The IUPAC Congress and General Assembly, held this past August in Ottawa, Canada, provided an excellent opportunity to reflect on the progress we have made in the past two years, thank those who have made exceptional contributions, and discuss changes we would like to institute as we look to the future. The scientific work of IUPAC is now focused on the ever-changing needs of the global chemical community. The new project approval system continues to be effective, and there is increasing focus on chemistry and its impact on society, as well as on chemistry education. The Union Strategic Plan highlights six long-range goals that guide the Union activities while it fulfills its mission. In my report on the State of the Union,1 I assessed IUPAC’s progress toward each of these goals. Here I will mention only a limited selection of the many and varied examples of how IUPAC is meeting these goals.Two major projects in 2002 and 2003 exemplify how IUPAC continues to be a leader in addressing global issues involving the chemical sciences. First, we provided essential advice to the Organization for the Prohibition of Chemical Weapons on the impact of scientific advances on the Chemical Weapons Convention. The second example is the international symposium that IUPAC and ICSU held in November 2002 in Japan, which examined the environmental implications of endocrine active substances. IUPAC is clearly making progress in its goal of facilitating the advancement of chemical research by providing the tools for international standardization and scientific discussion. As noted in the September issue of Chemisty International, the IUPAC Council officially approved the name darmstadtium, and the symbol Ds, for the element of atomic number 110, after the proposal was recommended by the Inorganic Chemistry Division. "Over the past two years, IUPAC has made great strides toward its goal of fostering communication among individual chemists and scientific organizations . . ."
By adopting a new system for managing projects, IUPAC has created new opportunities for advancing chemical research. Since the beginning of 2002 IUPAC has operated under a project system, through which proposals are actively solicited from within the Union as well as from chemists not directly involved with IUPAC. In 2002, 75 projects were approved, an indication of the awareness and effectiveness of the project system. Another important goal of IUPAC is to assist chemistry-related industry in its contribution to sustainable development, wealth creation, and improvement in the quality of life. This task falls primarily to our Committee on Chemistry and Industry (COCI), chaired by Dr. Wright, which continues successful projects such as holding safety workshops (see July 2003 CI), and a fellowship program in safety training (see page 12). In addition, IUPAC meets its commitment to education through its Committee on Chemistry Education (CCE), which was created at the beginning of 2002. The CCE focuses mainly on improving chemistry education in the developing world and enhancing public understanding of chemistry. The CCE has proved tremendously popular with over three dozen members thus far. Over the past two years, IUPAC has made great strides toward its goal of fostering communication among individual chemists and scientific organizations, with special emphasis on the needs of chemists in developing countries. Our electronic and printed communications are areas in which we’ve seen major advancements: Pure and Applied Chemistry and CI are now available online, e-mail has become the preferred vehicle for communication, the IUPAC Web site has become a resounding success with more than 300 000 hits per month, and the e-news has developed into a regular e-mail news alert. In addition, IUPAC has improved communication by enhancing the utility of PAC and CI. The increasing focus on special topics issues in PAC has proved to be very popular and the new design and organization of CI has enhanced its readability. IUPAC also helps advance communication on the latest chemical research by sponsoring a myriad of conferences and symposia on subjects such as bio-informatics, advanced materials, π-electron systems, biophysical complexity, and plasma chemistry. As the article on page 8 attests, the IUPAC Congress and General Assembly (GA) continue to be major events for connecting scientists—especially those who are just starting their careers—throughout the chemistry community. 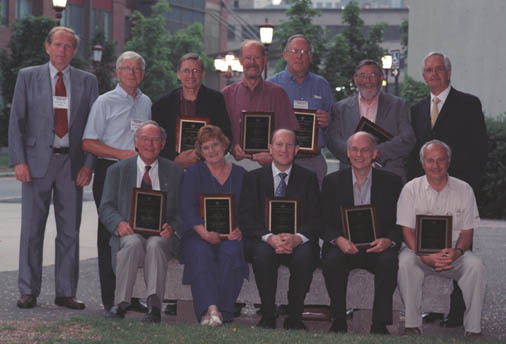 In Ottawa, we awarded nine IUPAC Prizes to the 2002 and 2003 winners. In addition, through the Young Scientists Program, 85 young chemists from 45 countries were invited to participate in the IUPAC Congress. A number of them were also invited to be Observers at the GA, in the hopes that they would become better acquainted with IUPAC and its many functions. IUPAC is also committed to broadening its national membership base and increasing diversity in IUPAC bodies with regard to geography, gender, and age. Bureau members Prof. Hitoshi Ohtaki and Prof. Bob Gilbert have visited the chemical fraternities of several countries to negotiate IUPAC membership; their efforts complemented the numerous recent visits of the vice president and myself to other locations. At the Council meeting in Ottawa, it was a great pleasure to welcome Bangladesh as a full member and Mauritius as an associate member. More recently, at the Mendeleev Conference held in Kazan, Russia, in-depth discussions were held with the chemistry leadership of the previous republics of the Soviet Union to encourage them to join IUPAC. The leadership of IUPAC takes enormous pride in the achievements of its members and their service to the discipline of chemistry. Obviously these achievements were reached through the contributions of a host of individuals, working either in teams or individually. In Ottawa, I presented awards to the leadership of IUPAC in recognition and appreciation of service rendered. The first awards were made to John Corish, Tomislav Cvitas, Robert Gilbert, Folke Ingman, Torbjörn Ingman, Parry Norling, John Ralston, Gerhard Schneider, Wendy Warr, George Wilson, and Nelson Wright. In addition, special tributes went to Ted Becker, retiring secretary general after 8 years of service, and to Alan Hayes, retiring past president. We salute you for your distinguished service to the Union. I am especially indebted to all my colleagues in the Union, and in particular the officers, members of the Bureau, and the executive director and his team at RTP. I stand in awe of the commitment of so many top-quality scientists—the “IUPAC Family”—to projects on behalf of IUPAC, the industrial community, and world chemical research. Your unselfish contributions enhance the image of IUPAC at the international level in scope and impact. Piet Steyn <psst@sun.ac.za> is the current IUPAC president and has been involved with the Union since 1973. He is director of the Division of Research Development of the University of Stellenbosch in South Africa. *IUPAC Statute 6.23 requires that the president submit to each regular meeting of the Council a report on the general state of the Union. Steyn’s report was made available in advance of the Assembly in July 2003, the full text of which is available at www.iupac.org/news/archives.html, under Union’s Plans/Assessments/Reports. Page last modified 4 November 2003.